We knew it was happening, but now things are official. 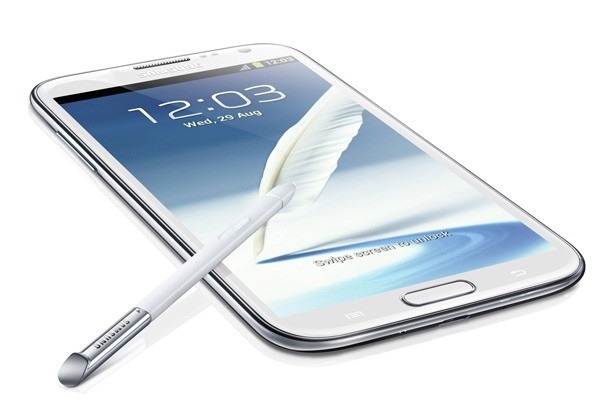 The Samsung Galaxy Note II is coming to Verizon, AT&T, Sprint, T-Mobile, and US Cellular. This is going to be a big deal, and not just because this phone is physically massive. The centerpiece of the Note II is the 5.5-inch Super AMOLED HD panel at 1280x720. This screen uses Wacom inductive technology so you can make use of a pressure-sensitive S Pen, which docks neatly in the body of the phone when you're not using it. Whereas the US Galaxy S III used Qualcomm's Snapdragon S4, the Note II will run Samsung's own Exynos quad-core chip. It's going to be clocked at 1.6GHz per-core and now has support for LTE modems. There is also support for 42Mbps HSPA+ when LTE isn't around. If you refuse to buy a phone with outdated software, worry not. The Note II will ship with Android 4.1, although you'll have to put up with TouchWiz. On the up side, TouchWiz includes a number of custom apps, like Idea Sketch, Easy Clip, and Air View, to make use of the S Pen. It also has all the usual Jelly Bean goodies like Google Now and Project Butter. Keep in mind that if you're planning to get the Verizon Note II, it probably has a locked bootloader. ROM flashers might want to give that one a few weeks as everyone searches for a solution. Galaxy Note II marks the U.S. debut of Samsung’s Exynos™ 1.6 GHz quad-core processor optimized for LTE networks. It has 2GB of internal RAM; and comes with 16 GB of onboard file storage and supports up to 64GB of additional memory with a microSD® card. Collectively, these deliver easy multitasking, lightning fast screen transitions, powerful browser performance and minimal app load time. At the heart of the Galaxy Note II and the ability to create and collaborate is the S Pen™, which has been ergonomically redesigned to provide a more precise and natural writing and drawing experience. The new S Pen can sense 1,024 levels of pressure sensitivity, four times more than the original S Pen. Quick Command, the S Pen quickly activates applications and services people use most often. The command pad appears with one upward swipe on the screen with the S Pen button pressed down. Users can send an email, make a call or search a location with pre-registered and customized S Pen strokes marks made on the command pad. Idea Sketch - allows users to easily add illustrations by handwriting keywords on the S Note. It provides illustration images that match the handwritten keywords. It’s a fancy illustration match function that will allow users to express, organize and visualize ideas in a more innovative and creative way. Users can even customize and add in their own illustrations library. Photo Notes which allows you to create handwritten notes on the back of digital photos. Popup Video extends the concept of ‘Popup Play.’ While watching a video, with the touch of a button, the video will become a floating window on the display. The video will continue to play and it can be re-sized or repositioned to any part of the GALAXY Note II’s screen. This versatility means that users are free to load other applications beneath it to browse online or work in other apps such as email, calendar or text messaging. S Beam – Tap back of Galaxy Note II against another S-Beam-enabled device to share large video files, documents or S Notes in seconds without using data service. Share Shot - Seamlessly share pictures taken with Galaxy Note II’s 8 megapixel camera to other phones from up to 200 feet away. Burst Shot/Best Shot – Capture rapid-fire still pictures with zero shutter lag; choose picture with optimal colors, lighting and clarity from Best Shot image recommendations. AllShare Cast™ and GroupCast™ have been expanded on the Galaxy Note II. Share premium video content, mobile games and movies and TV shows from Samsung Media Hub wirelessly with Samsung Smart TVs, laptops, tablets and other consumer electronics. · Protective Flip Cover – Samsung’s unique flip cover enhances the look of the Galaxy Note II with a premium leather front and glossy backing, while providing privacy and protection. The Protective Flip Cover comes in seven vibrant colors to customize the Galaxy Note II, including Titanium Gray, Marble White, Blue, Pink, Mint, Lime Green, and Orange. · S Pen with Eraser – This ergonomic, full-featured S Pen features a button for gestures and an eraser tip for easy corrections. This updated version of Samsung’s original S Pen truly mimics the feel of a pen or pencil.